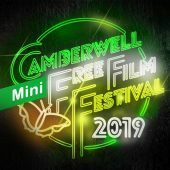 Camberwell Free Film Festival is back in 2019 for a short season in April. Full programme below. The annual festival is completely run by volunteers and we always welcome new helpers. If you’d like to get involved in the this year’s festival, we’d love to hear from you. Simply contact us (see contact details at the top of the right hand column of this page).